Disclaimer. I love my husband and am so happy he thinks of me often. A few weeks ago I mentioned I would like new towels. The navy towels I bought for us at a department store 7 years ago were disintegrating rapidly. They had served long and well yet featured holes and torn seams. “Time for new towels” I declared! Fully prepared to wait for a sale or coupon (or both!) I was thinking about towel colors and thickness and so on. Yes. I dwell on these things. And I was quite certain I made myself clear, I was buying the towels at the day and hour and store and price point of my choosing. About 3 days after my announcement my husband arrives home with some plastic Dollar Store bags and a proud look on his face. “I got some new towels! And they were only 3.00 apiece!” I assume that he assumed the bargain lover/hunter in me would be happy with his choice. And I tried to be. I washed, folded and placed the new towels in our bathroom. Unable to avoid the fact after the initial washing there were already loose seams. I took a bath. I got a towel. I wiped, rubbed and writhed about the bathroom attempting to get dry. It didn’t work. “Give them a few washings to get broke in” I think to myself. A month into it I take a shower, “dry” off and go to bed. “You still feel kinda damp there honey” my husband says. “Yes, it’s those towels” I snap. I’ve been telling him for a while, in a kind way, that his towel selection sucked. I was tired of being kind. He has said nothing more but in the interest of health I am buying new towels. Are they cheap? No. But I am not willing to grow mold on my person to justify my darling husbands dollar store ‘bargain’. The point is this. Save where you can. Recycle what you can. Save the planet! 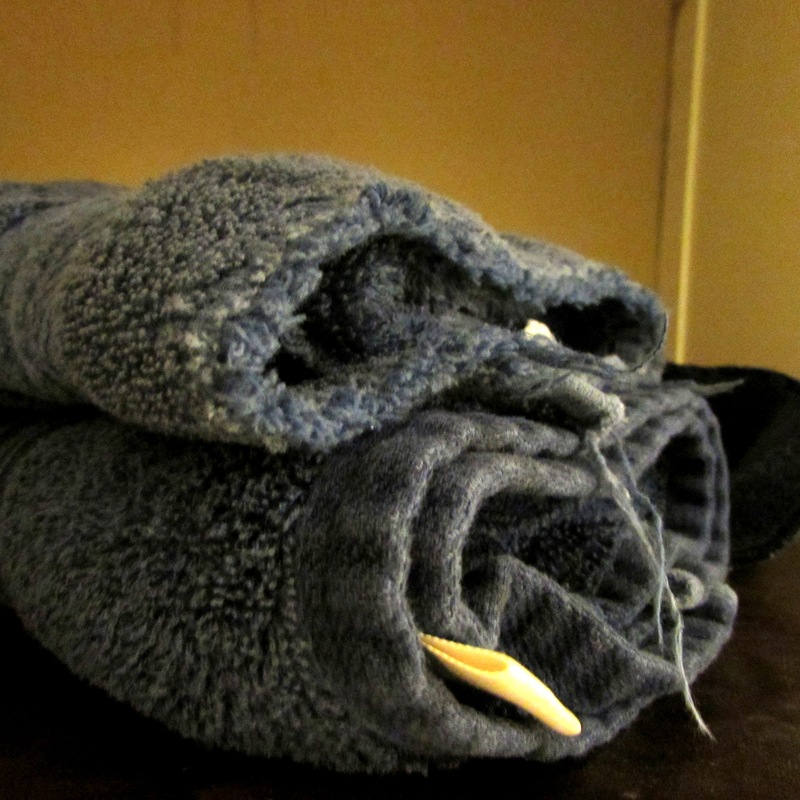 These, were good towels. For seven years. Could be a guy thing! I prefer the smaller thinner towels to the big fluffy ones! Maybe hubbie was just looking at price maybe! My wife loves the fluffy ones with beauty all over them but as a guy I don’t! I recall visiting friends who display beautiful monogrammed towels that I’m afraid to touch after washing my hands so I just do the “jeans dry shuffle”! A lot of us guys don’t need fluff, monogram and beauty! One exception, we do want beauty and smell good in our woman & beauty ain’t gotta be just outside either! I got both! I just want to get dry! 🙂 haha! I’m the one who bought the cheap towels in my family. They frayed and one of our dogs got to it, chewed and swallowed it. $1000.00 vet bill followed when the towel lodged in her intestines. So those cheap towels were very expensive. I hate towels that don’t dry. I don’t care if they’re cheap, fluffy, or cute, but they’d better not leave me damp or covered in copious amounts of towel lint. I bought the ‘bath sheets’ at Target (read: Tar-zhay. That’s French, you know), and I am very happy with them, and I think they were $6/ea on sale. I still have some of my Springmaid towels I bought back in the 90s…those rocked. And furthermore, I agree with Dave. What’s up with monogrammed towels? People use them for display only and when you go to dry your hands with them (I’m not as nice as Dave), they don’t dry your hands because apparently they went straight from the Expensive Towel Store to the Monogrammer to the bathroom towel rack without ever being washed! So they are not even broken in and the monograms are scratchy. Maybe I think about towels too much. I think.